Cloud hosting will only be as reliable as your internet connection. You should consult your IT professional to determine if multiple internet providers should be used to provide redundancy. If your internet connection is lost you will also lose access to the hosted software. We provide you with a simple application that will log in to the cloud server and allow you to easily start the hosted software. 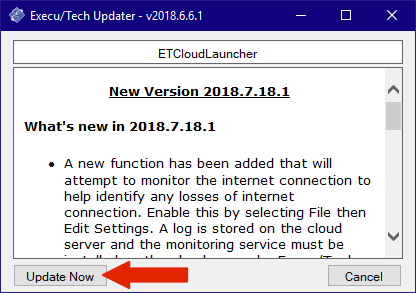 This application must be installed at all computers that need access to the hosted software. Click File and then click Download Update. 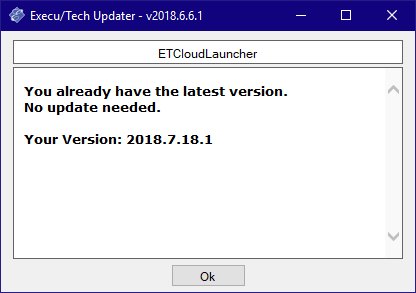 If you already have the latest version you will see this. If a new version is available you will see this. 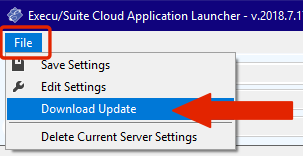 Click Update Now to download the update. After the update has been downloaded the application will be restarted.